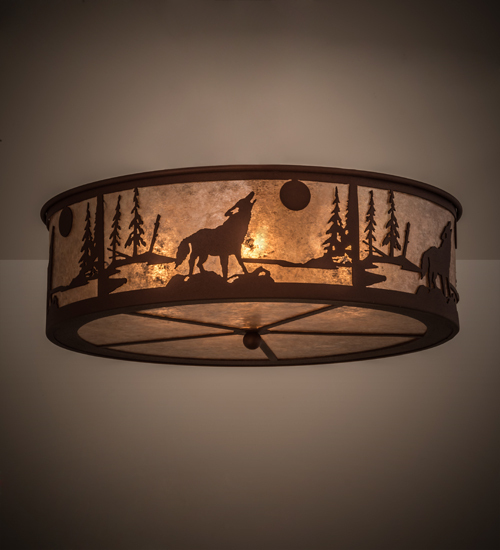 Description: The call of the wild is captured splendidly with Wolves howling at the brilliant Super Moon in the forest, as depicted in this natural wildlife inspired fixture. Beautiful ambient light projects through a stunning Silver Mica diffuser. The shade is complemented with a frame and hardware featured in a Rust finish. Handcrafted by highly skilled artisans in our 180,000 square foot manufacturing facility at the foothills of the Adirondack Mountains. Custom colors, styles and sizes are available. Dimmable energy efficient lamping options offered. UL and cUL listed for dry and damp locations.